Project obstacles and solutions: Brian Payne Construction is a leading residential home builder in western Kentucky. 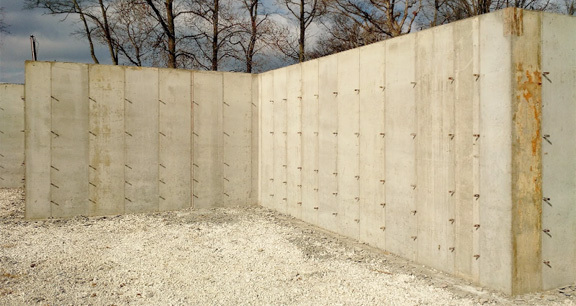 Porter Concrete does the majority of Payne's concrete work, including basement walls. As the demand for new homes has picked up, any efficiency in construction time is a plus. Hank Porter, owner of Porter Concrete has been challenged with not having enough time to keep up with the high demand. "Time is money," says Porter, "and I'd really like to have more of both." One way this job saved time and money was using imix EZ Wall WP for the concrete walls. This concrete product adds a waterproofing agent to the concrete so the walls will resist water as soon as they have cured. The industry standard for damp proofing basement walls has long been achieved by applying petroleum-based mastic or tars to the outside of cured walls either by rolling it on or spraying it. Not only is this a very messy, time consuming process, but it can also be a safety hazard for workers applying it in confined spaces. The damp proofing process can deteriorate over a fairly short period of time in relation to the life of the home leaving virtually no protection against leaks. Using imix EZ Wall WP eliminated this problem. This basement was poured on December 7, 2015. The mix was poured at a 7.5 inch slump. Hank Porter commented on how creamy the mix was considering the high slump. After the wall forms were stripped the next day, Porter's crew was able to backfill and move on to the next job. Porter said his crew was very happy they did not have to apply the usual mastic damp proofing - especially during cold weather. "This was the easiest basement construction job we've ever had. I'll never go back to our old process again," stated Porter. Besides the time savings, imix EZ Wall WP provides lasting protection of basement walls. The waterproofing is permanent, eliminating the headaches of callbacks years later once the coatings have deteriorated. Key components in the mix seal off capillary tracts in the concrete where water would normally penetrate the wall. It also continues to actively work on any cracks that develop in any part of the wall throughout its lifetime. Porter and Payne found imix Easy Wall WP to be a cost effective solution for pouring and sealing basement walls. Not only are the time savings worth it, but it is competitive with the costs of coatings and other topical pore blockers. For more information on imix EZ Wall WP, click here. To contact a sales representative for your area, click here.